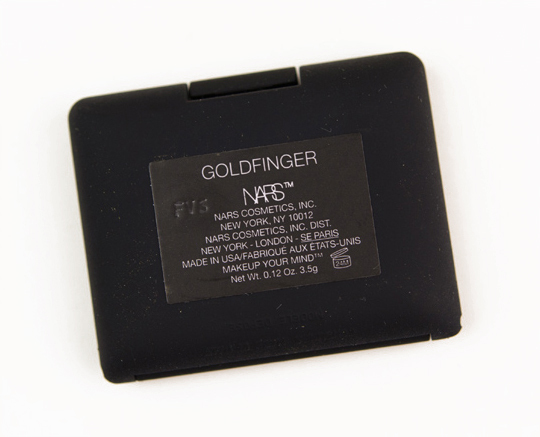 NARS Goldfinger Eyeshadow ($23.00 for 0.07 oz.) 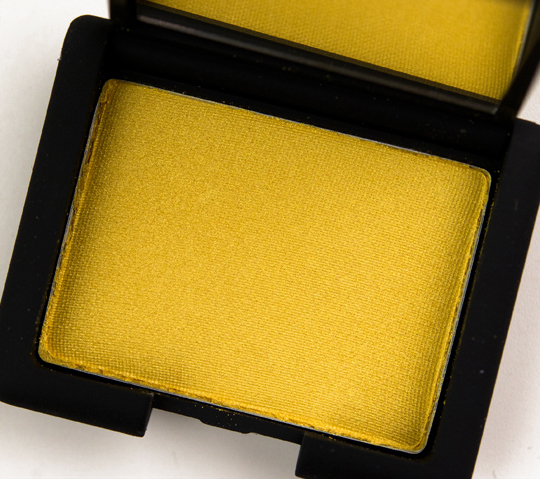 is described as a “24 karat gold shimmer.” It’s a pop of yellow gold with a metallic sheen. The texture is soft and smooth, which is exactly what you want with a metallic finish, so it really retains its reflective nature. MAC Goldmine is much darker, while Urban Decay Eldorado is very similar but the quality of Goldfinger is much, much better. Inglot #403 is similar but a touch darker. Make Up For Ever #10 is pretty close but a little more orange-based. 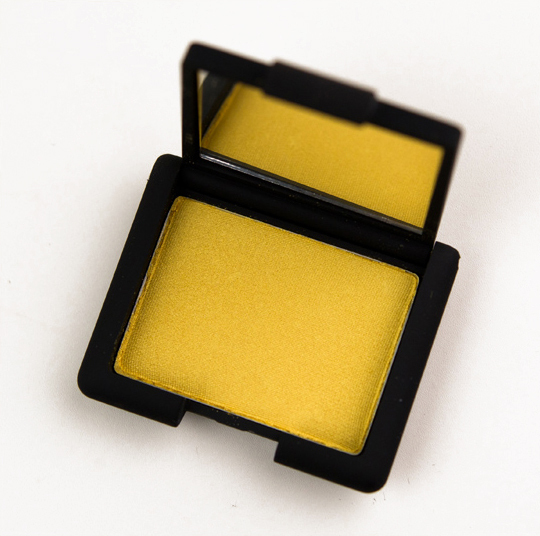 NARS Eyeshadows are described as “ultra pigmented, long-wearing, [and] crease-resistant” that can be applied wet or dry. I get around eight hours of wear before I notice subtle creasing with NARS’ eyeshadows, so I would still wear an eyeshadow primer if I wanted all-day wear. The packaging is slim and compact with matte black rubberized packaging that absorbs impact better than a harder plastic. There is a mirror inside the compact as well. This was my first nars eyeshadow, that I got like 10 years ago! wow, that swatched much differently than i expected. from the pan i didn’t even realize there was shimmer in it. How do you decide whether to review similar products individually or in one big post? I prefer to review products individually, so each product can be rated on its own merits. I only review products lumped together if I have to. hey honey …. I wanted to ask you one thing for a long long time … sorry my bad or ?? still smitten by your purple look with MUFE …. I thought the exact opposite about the packaging. I don’t usually brake any of my makeup but I have with a few of my nars powders. One time I had a blush in my hand litteraly 12 inches off the ground, I dropped it and it broke into a million peices. I have dropped makeup from others brands down 2 flights of stairs and they were fine. The compacet just seems to absorb none of the impact. I’ve dropped about 10 NARS products (for testing purposes) about 2-3 feet over tile and everything’s been intact 🙂 I wouldn’t emphasize such a point without testing it myself. Christine I love this color! Thanks for letting us know about the sell I got some stuff I always wanted and the mini palatte night series! Very Happy 🙂 I loved your Muppet look buy the way! I honestly didn’t think I was going to like this at all in the pan then you swatched it! Wow is it lovely swatched! Goes from kind yuck yellow to ooh shiny gold! Thanks for yet another great post! Is this comparable at all to MAC Going Bananas? Agreed! The swatch is disappointing. Wow, this is gorgeous. Not at all what I expected from the pan picture. It looks like it would be very wearable for everyday. Awesome! Wow – looks way different on your swatch than in the pot! 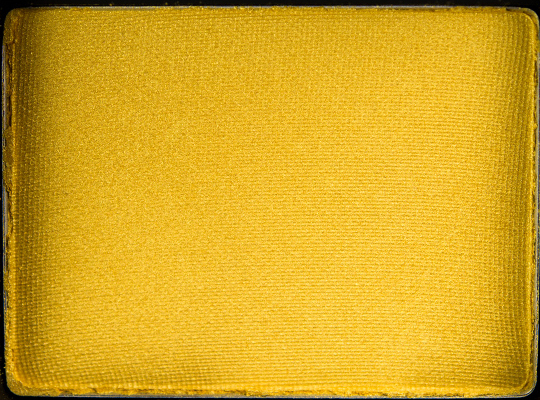 I could wear that yellow – or would wear it I should say. 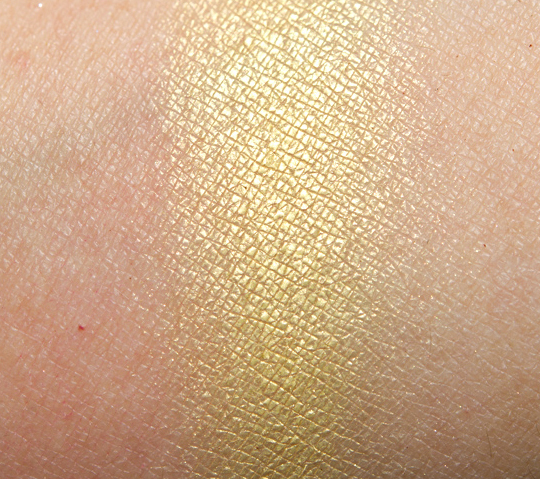 I was so surprised by how different it was when swatched I literally said “Wow!” out loud. Extremely disappointing.